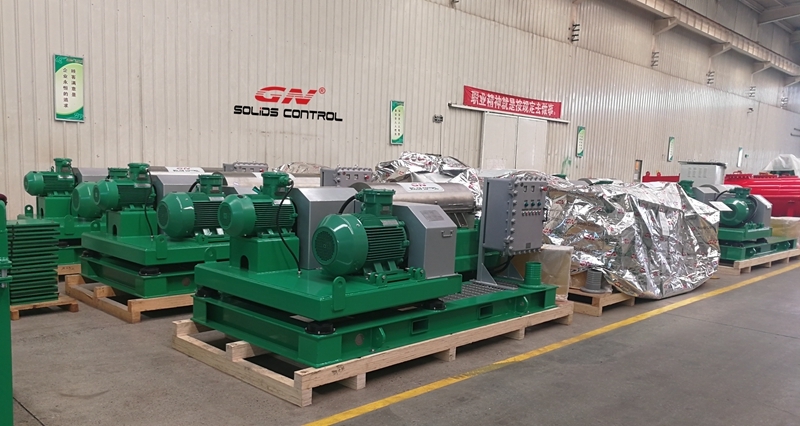 This week GN solids control shipped one unit of 4 phase cleaning HDD mud recycling system to Sinopec. 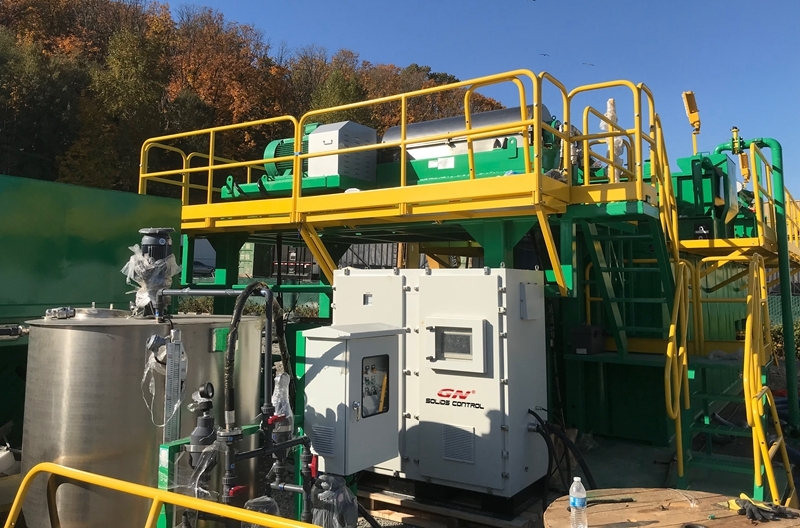 Normally the HDD mud recycling system is with 2 phase cleaning or 3 phase cleaning, this system is customized for 4 phase cleaning. 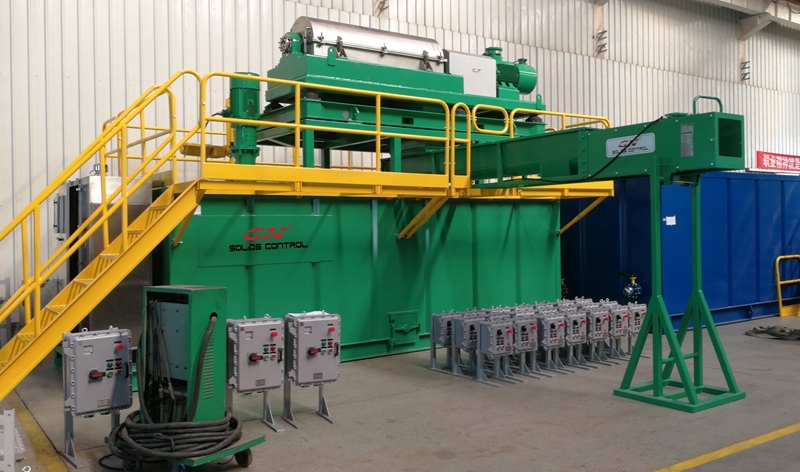 1) 1 unit of linear motion shale shaker GNZS703F-DZ installed with 3pcs of composite material shaker screens for free, 2 units of Italy Oil brand vibration motors with max G force 7.5G, which is adjustable. 2) 1 unit of linear motion mud cleaner GNZJ703F-1S8N with 500gpm treating capacity with 2 units of centrifugal pumps as feeding pump of desander cone, desilter cone. The underflow shale shaker model is same with the shale shaker GNZS703F, same dimension shaker screens. 3) 1 unit of VFD decanter centrifuge GNLW363C-VFD, with non explosion proof VFD control panel to adjust the frequency to adjust the rotary speed of the centrifuge, it can control the flow rate by adjust the speed. Vertical submersible slurry pump is installed on the mud tank as feeding pump of decanter centrifuge. One set of screw conveyor is installed to transfer the solids from the centrifuge discharge port to waste container. It is an automatically operation system and no need worker to watch for it time and time. 4) 2 mud tanks with same dimension for convenient shipment, the shale shaker and mud cleaner are equipped in a same dimension frame, which can be put on the same trailer for movement. 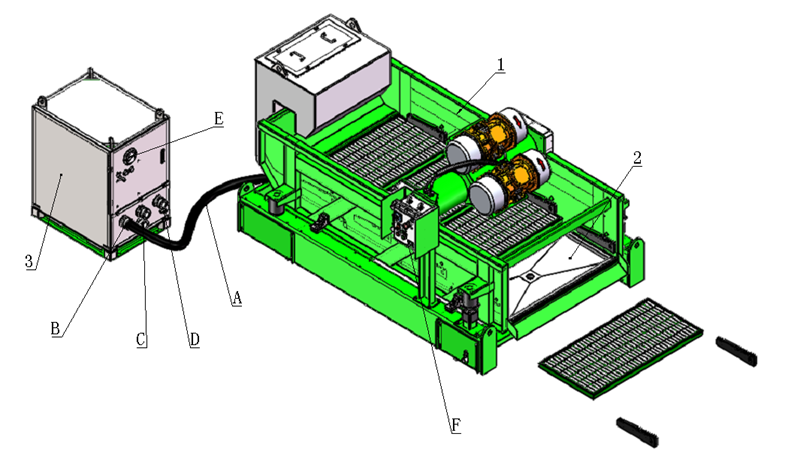 The unit is installed under the last screen of the shale shaker or installed externally of the shale shaker. It needs a air compressor to provide air supply for operation, most of the rigs will own one air compressor, no need to buy extrally. 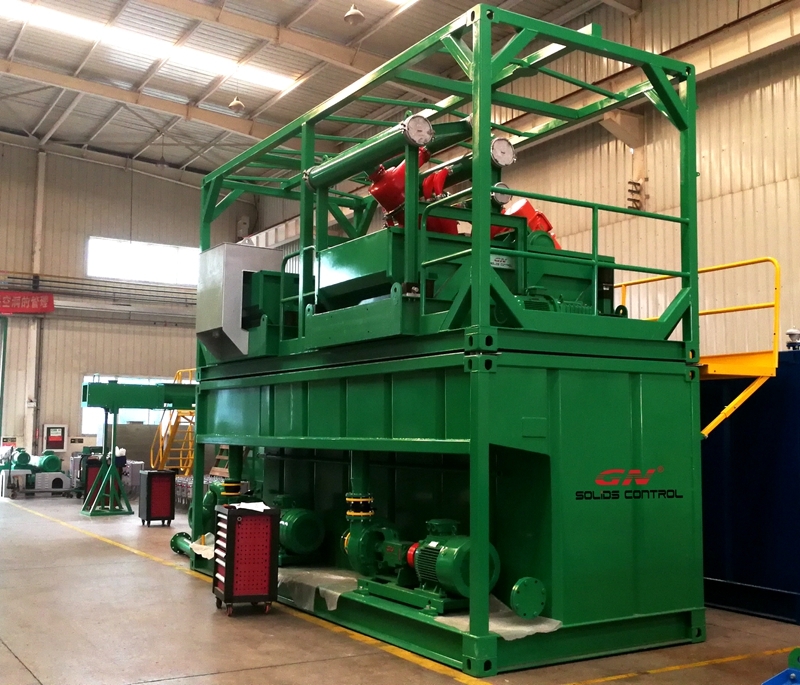 The air will create suction on the last screen of the shale shaker, reduce the liquid on the cuttings by 30% to 50%, separation of the fluids out of the cuttings. 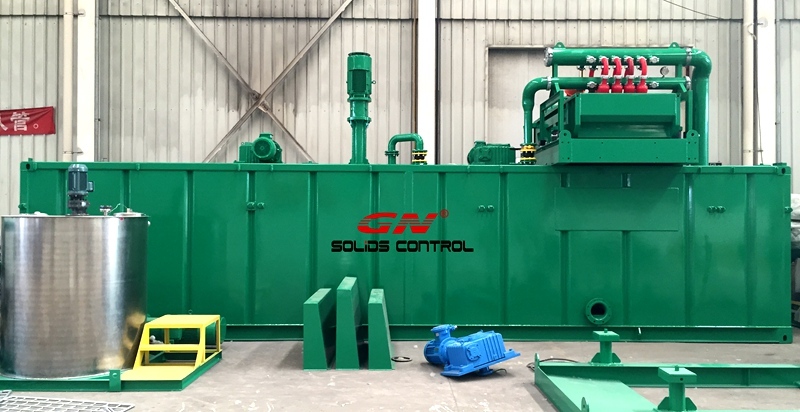 GN solids control will participate in the OTC 2018 as usual and show our most advanced equipments there. 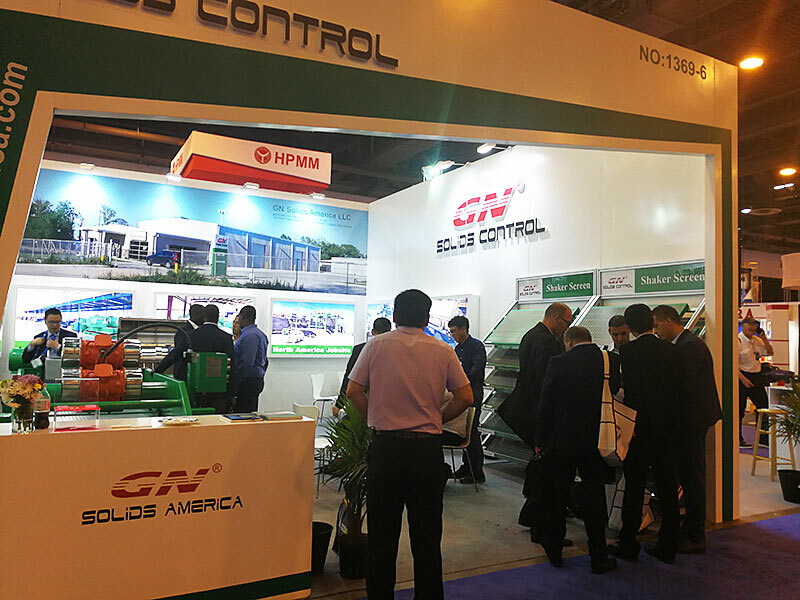 One stand will show the equipments in the name of GN solids control, the other stand will show in the name of GN solids America LLC, which is our brand company in Houston, TX. 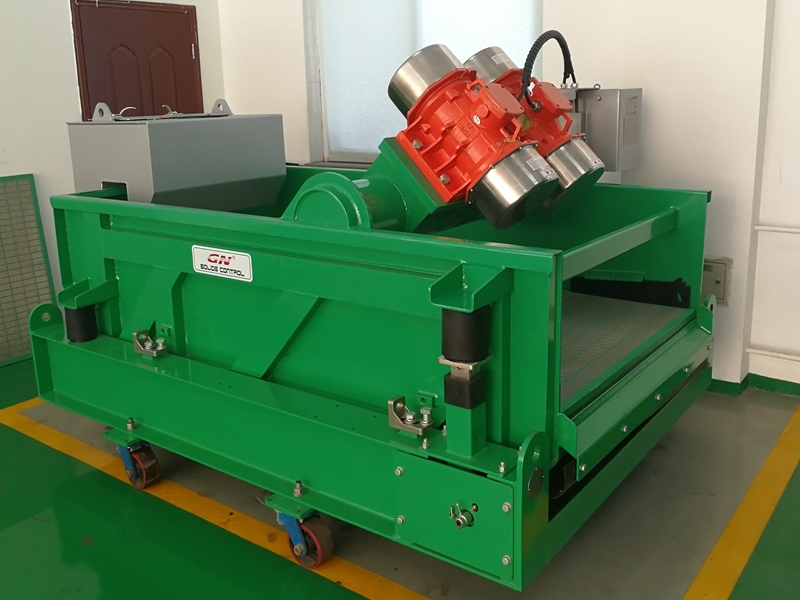 Decanter centrifuge GNLW363C, decenter centrifuge can be applied for oil sludge separation, drilling waste management system, solids control system, dewatering unit, etc. Shale shaker: GNZS594F-HB , the 4 panel shale shaker installed with 4pc GN composite material shaker screens, screen dimension 585x1165mm, the screen area is 2.73m2, the vibration motor is 2.3HP Martin brand vibration motor made in USA, The shaker deck bottom is made of stainless steel which is fluids touch parts. Sludge Vacuum pump: GNSP-20A, slurry pump is used as transfer pump for drilling cuttings, dredging slurry, all kinds of oil sludge based on density and viscosity. We need to confirm if the vacuum pump can be used to transfer oil sludge based on the density, viscosity, depth, pressure,etc. Dredging slurry separation system/ Industry waste water treatment is one of the applications of GN solids control, except for solids control system, drilling waste management system, oil sludge treatment system, horizontal directional drilling system, core bed methane drilling, geothermal well drilling, water well drilling. 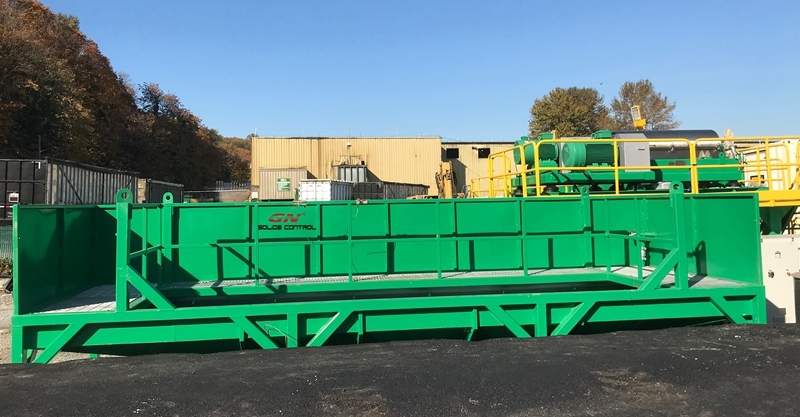 First step cleaning: shale shaker, to separate the solids bigger than 100 microns from the water, we will metal slit screen or complete composite screens to separate the big solids, like bricks, garbage, branch, rocks, etc. 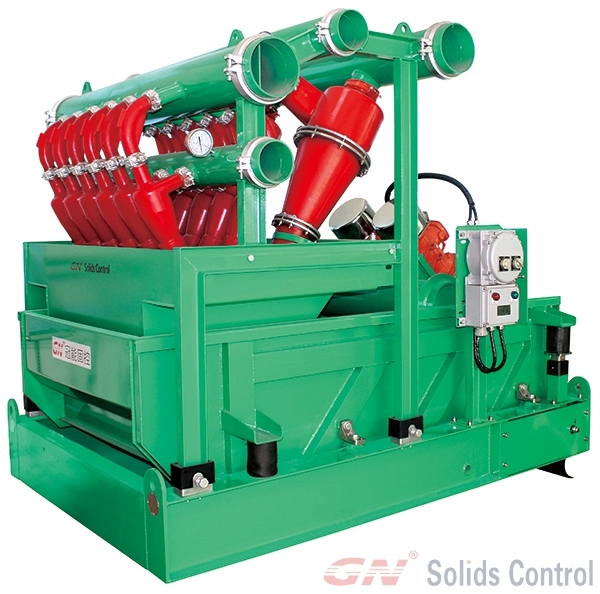 For a 1000gpm sludge separation system, we will use 2 units of GN 4 panel shale shaker. 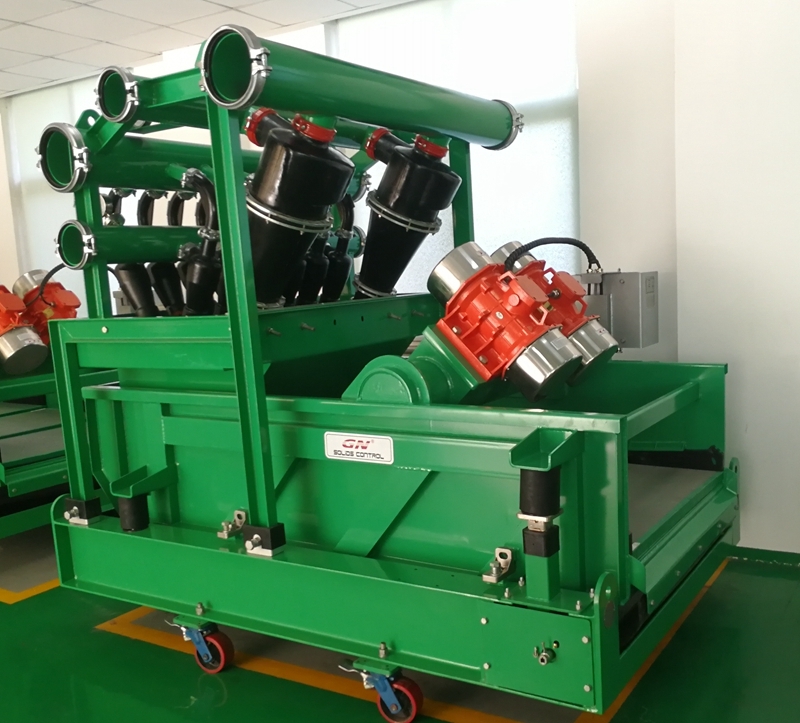 But the shale shaker may not be necessary when there is no big solids and all of the particles are smaller than 100 microns, it will be useless. Second step: desander cone with bottom shale shaker to separate the solids between 45 microns to 100 microns, 2 ea of 10 inch desander cone is sufficient for 1000gpm treating capacity. Third step: 4” desilter cone with bottom shale shaker to separate the solids bigger than 20 microns, 12 ea of 4 inch desilter cone is enough for 1000gpm treating capacity. The fourth step: 2” desilter cone with bottom shale shaker to separate the solids bigger than 10 microns. 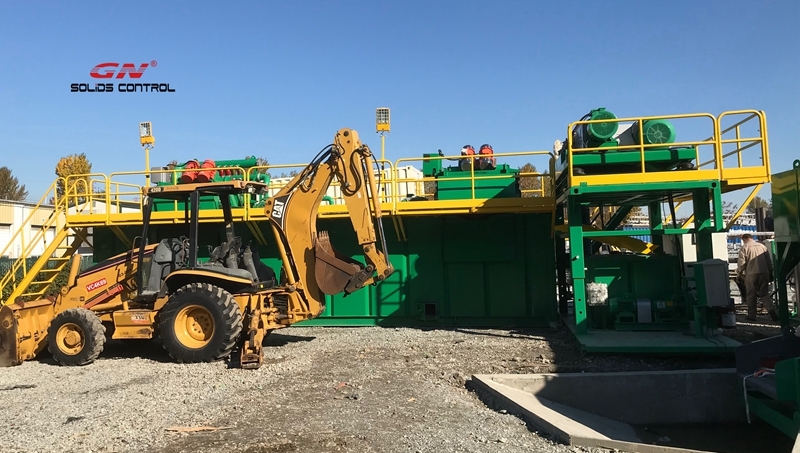 Recently GN solids control engineer is working in the jobsite of the USA client for construction industry for the slurry separation system installation and first time commissioning. 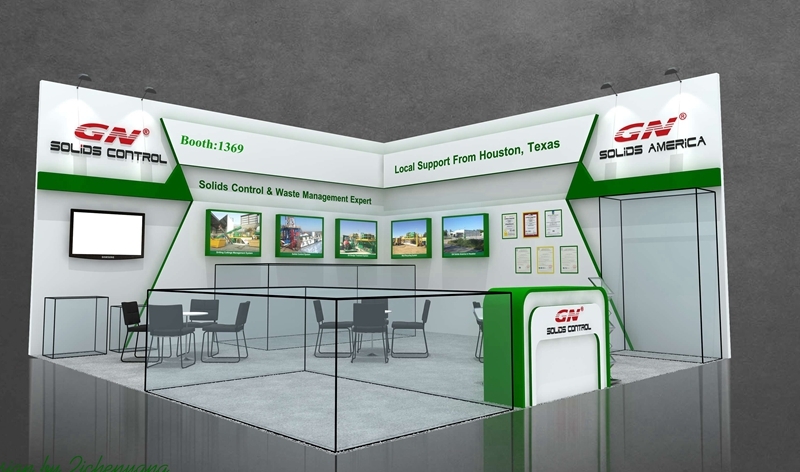 We have branch company in Houston, USA called GN Solids America LLC, we will responsible for the after sales service and pre- sales service and money collection, we also have spare parts in stock to meet the client’s operation requirement. Once there is any trouble shooting in the jobsite, the client can call GN directly to get the immediate service. The client totally bought 2 sets of such slurry separation system with the same technical configuration. The equipments below are composed in the system. The drying shaker is a 4 panel shale shaker with high G force up to 8.0G, the composite material shaker screen lasts longer working life and better performance. 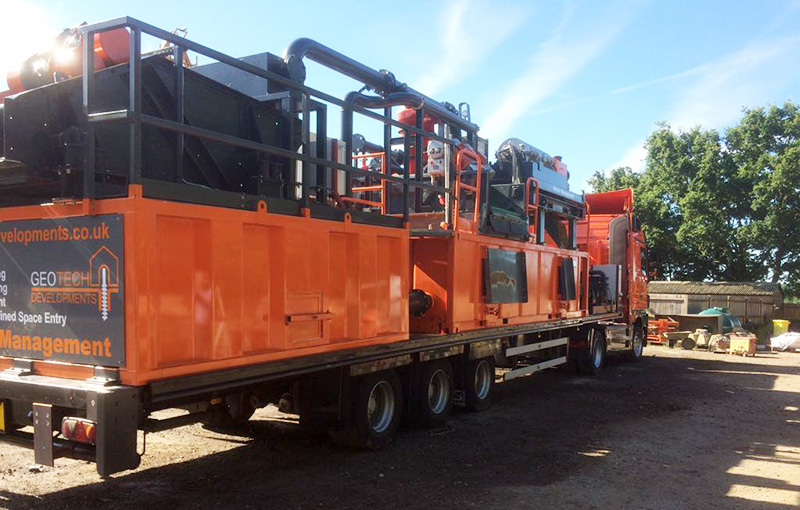 The mud cleaner is the combination of the desilter cone and bottom shale shaker to separate the fine solids from the slurry. 5) Big bowl big volume decanter centrifuge: The 22 inch bowl diameter decanter centrifuge max treating capacity is 110m3/h for clean water, the normal treating capacity for drilling fluids treatment is 90m3/h, for slurry separation with chemical dosing system, the treating capacity will be reduced a lot based on different slurry conditions. Not only for oilfield drilling fluids recycling system and drilling cuttings treatment, GN solids control equipments can be also used for no dig trenchless industry, like HDD, CBM, Geothermal drilling, water well drilling, we also design customized slurry separation system for construction industry, like TBM, Bore pilings, tailings cleaning, etc. Welcome to contact GN solids control or GN solids America for a quotation. 1) 2 mud tanks are installed on the trailer, the total height of trailer plus mud tank system can meet the road transportation limit in Europe. The 2 mud tanks are connected by bottom balance pipeline to keep the mud level in balance and when one mud tank is full, it can flow to another. 2) The shale shaker, mud cleaner and decanter centrifuge are installed on the mud tank. The 3 panel shale shaker with 3pcs shaker screens total area 2.63m2, each screen dimension is 700x 1250mm, the composite material frame shaker screen last 20% longer lifetime than previous steel frame shaker screen. One feeding pump feed the drilling fluids to desander cone inlet pipe, the clean fluids are discharged from the desander outlet pipe and drop into the mud tank. 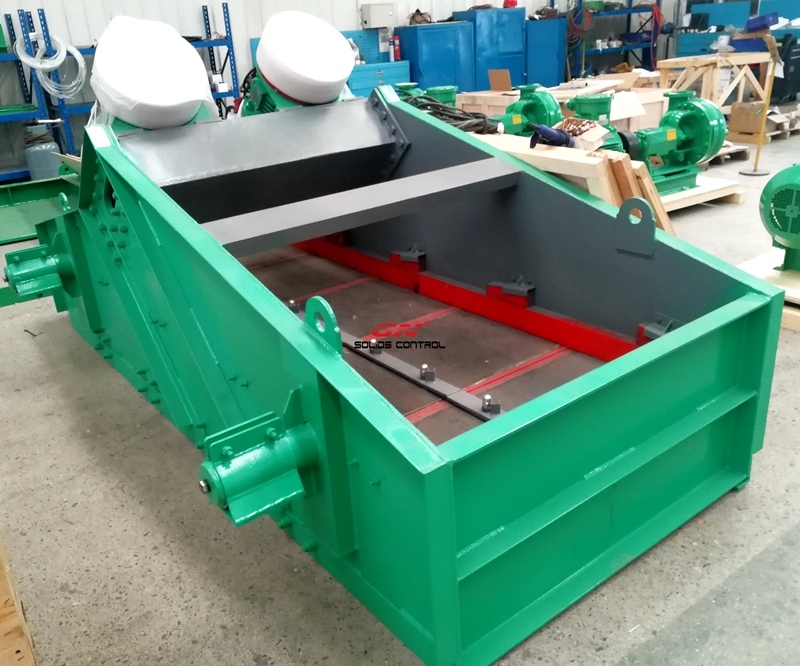 The solids are separated out from the desander nozzle and drop down to the shaker screen, the big solids are separated out from the shaker screen and useful fluids will pass through the screen opening and drop into the mud tank. Then the desilter feeding pump treat the fluids again by the same way. High speed decanter centrifuge with separation cut point 2 ~3 microns, the normal working speed is 3200rpm, the max speed is 3900rpm, normally mud recycling system do not install decanter centrifuge, only when after many year operation, the drilling fluids accumulated many fine solids which can not be reused again or when the drilling is finished, the operator need to clean the tailings. These equipments will be shipped by 4 batch, this is the 2nd batch. All of them are our major solids control equipments, which have been proved to be good quality, good performance and competitive price. We also have another type of degasser-centrifugal type degasser which is very popular in Russia market, the features of centrifugal degasser is compact design, easy maintenance, high efficient. The vacuum degasser is a horizontal type degasser with steady operation performance, no need jetting pump compared with Derrick type vacuum degasser. We have fixed type centrifuge and VFD decanter centrifuge, the client choose fixed speed centrifuge for oil & gas drilling rig, if the client use the centrifuge for drilling cuttings treatment and dewatering unit, the VFD decanter centrifuge is applied. The linear motion mud cleaner with 1000 gpm treating capacity, 2 ea of desander cone and 12 ea of desilter cone. The bottom shale shaker model is same with the linear motion shale shaker, the client only need to make stock for one dimension shaker screens. 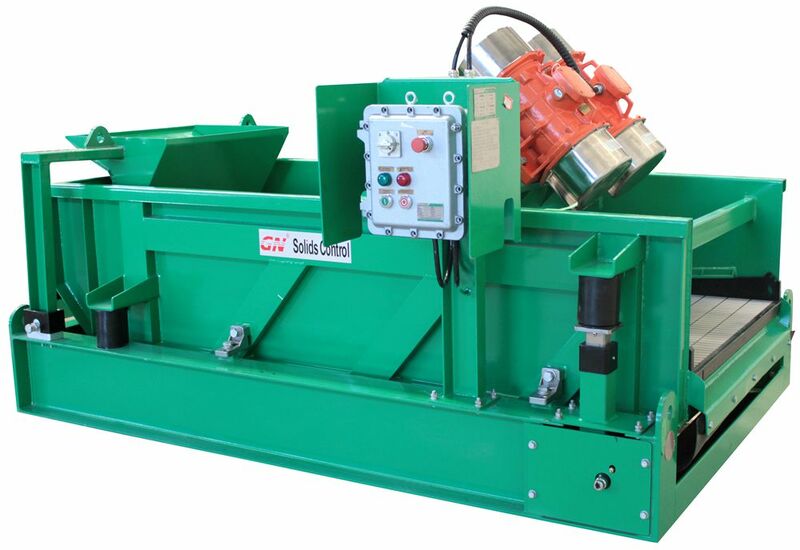 The linear motion shale shaker is 3 panel shale shaker with durable composite material frame shaker screen. 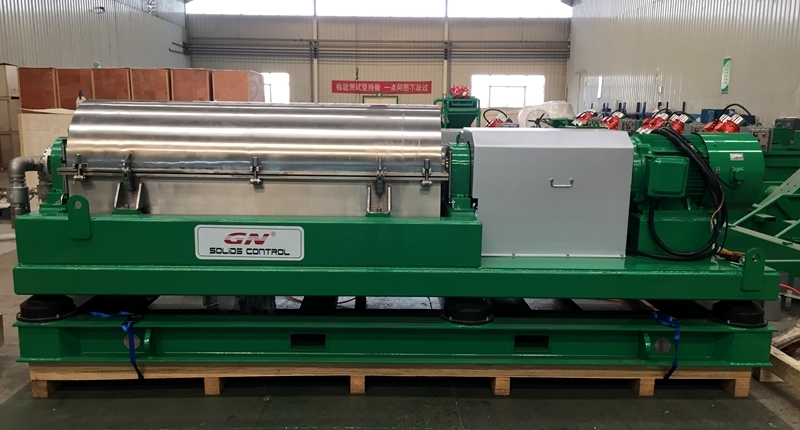 GN solids control produce the shaker screen by our own factory to keep the goods quality and fast delivery time. Our shaker screen wire mesh configuration has passed API RP13C test by authorized third party company in USA, all the shaker screens bigger than API 50. Welcome to send us inquiry for your drilling rig solids control equipments requirement. The main purpose for the promotion plan is that to introduce our good quality, competitive price shaker screens to our clients, most of these clients are drilling companies, who will use shaker screens for their daily operation, their huge requirement of shaker screens lead them to control the purchasing cost to lower their drilling total cost, because their client also cut their budget and offer them less price for the drilling operation. GN own advanced production technology of composite material shaker screens, the screen frame is composite material, the screen wire mesh material is stainless steel 304 or 316L. GN composite material frame screen has passed the API RP 13C lab testing of third party in USA. 1) All the clients who bought GN composite material shaker screens can apply for the screens point reward program. No matter for the OEM screens of GN brand shale shaker or replacement shaker screens for other brand shale shaker. 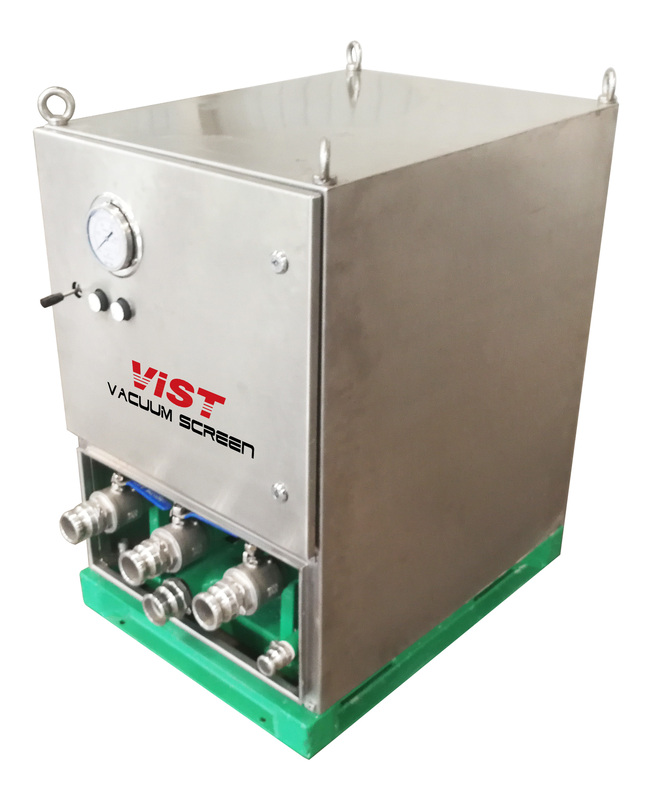 2) Each piece screen purchasing equals to one point, the accumulated bonus points could be used as part of the cost, up to US Dollars 15,000, of the equipment. The drilling companies need to replace their solids control equipments once the old equipments are too old to treat the drilling mud well, like shale shaker, mud cleaner, decanter centrifuge, etc. But the purchasing order with discount over 10% is excluded with the promotion plan. You can get either award for the shaker screen purchasing. 3) The clients purchased from GN Solids America LLC in Houston, TX also can participate in the promotion plan. GN solids control will show our composite material frame shaker screens at Oil & Gas Indonesia 2017 in Jakarta, Indonesia. 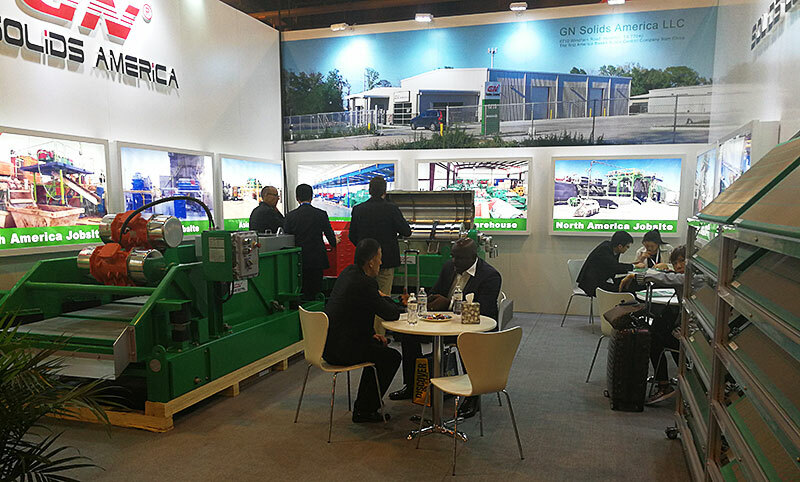 This is not the first time for GN to participate in this oil exhibition, we start to show our solids control equipments from September, 2013. 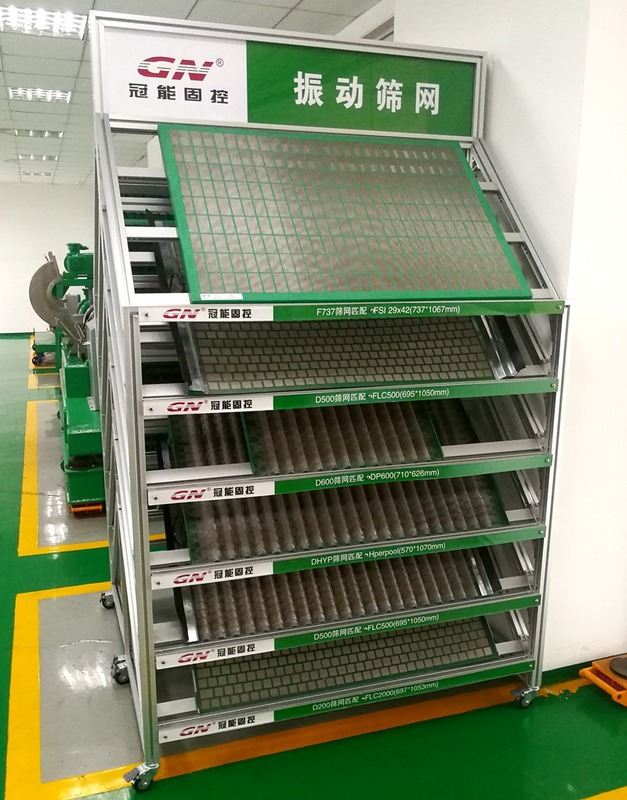 5) OEM shaker screens for all the models of GN brand shale shaker, including GNZS703, GNZS594E, GNZS752, GNZS706, etc. GN solids is the top shaker screens manufacturer in China who get the API RP13C lab testing report this year by testing the wire mesh configuration, conductance, screen hole opening, etc. For potential clients who is big drilling companies, we will provide free samples to test before order. Pls contact with GN solids control sales engineer before order. 2) Longer working time and repairable with plugs when it is a little damaged, the wire mesh is stainless steel material, SS 304 or SS316L, it is depends on the client’s different requirement. 3) Better separation performance: the screen opening is correct and the wire mesh thickness is the most important issue for wire mesh. 4) Longer effective screen area for better working performance.